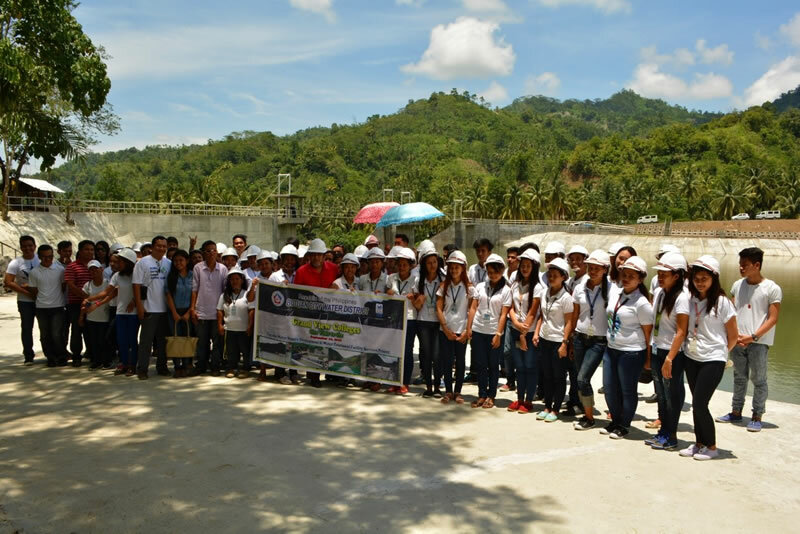 ..Scholars, staff and faculty of Grand View Colleges (GVC), headed by its president Manuel A. Esteves, pose for posterity during their visit recently to the project site of the Taguibo Water Supply Development and Water Treatment Facility Service Project (T..
Over a hundred scholars, staff and faculty of Grand View Colleges (GVC) were briefed on the Butuan City Water District (BCWD) operation and were updated on the status of the Taguibo Water Supply Development and Water Treatment Facility Service Project (TWSDWTFSP) during their visit recently to the project site in Iyao, Anticala, Butuan City. Grand View Colleges (GVC) is a non-sectarian and a not-for-profit institution of learning that operates through scholarship funds from local and international individuals, philanthropists, organizations, and companies with the advocacy of empowering the youth through access to free education. Currently, GVC has over a hundred full scholars who are poor but academically deserving students. As part of the school’s social responsibility, the scholars are trained to be involved in community activities and issues of social concern. The activity was, then, part of GVC’s social responsibility which is getting involved in issues affecting the society such as issues on water supply. With this activity, GVC scholars, faculty and staff have been enlightened on the issues attached to the project and the water supply situation in Butuan City. As such, they will be able to help disseminate the right information to the community pertaining to the project and the BCWD’s efforts to improve its water services. Thus, the briefing and site visit to TWSDWTFSP served well the school’s primordial objective which is molding and shaping its scholars to become socially relevant individuals. They also visited Mahayahay, part of the Taguibo Watershed, and the BCWD Filtration Plant in Taguibo, where they cleaned the areas. The project includes a catchment area called the Impounding Weir, which can hold an estimated volume of water good for 30 days supply to over 42,000 concessionaires and new water facilities that can supply water even during rainy days and prolonged dry season. This is expected to finally solve the problem of high water turbidity of the source, the Taguibo River, during rainy weather causing water interruptions.